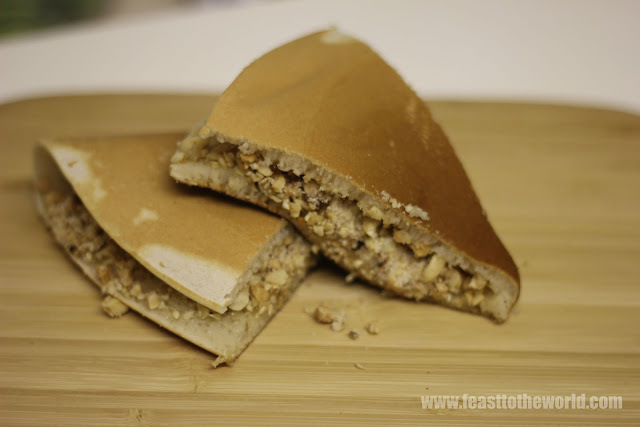 Mee Jian Kueh (peanut pancakes) is a popular snack back in Singapore. I remember I used made a special trip to the local hawker centre to grab a few of these on my way home after school. 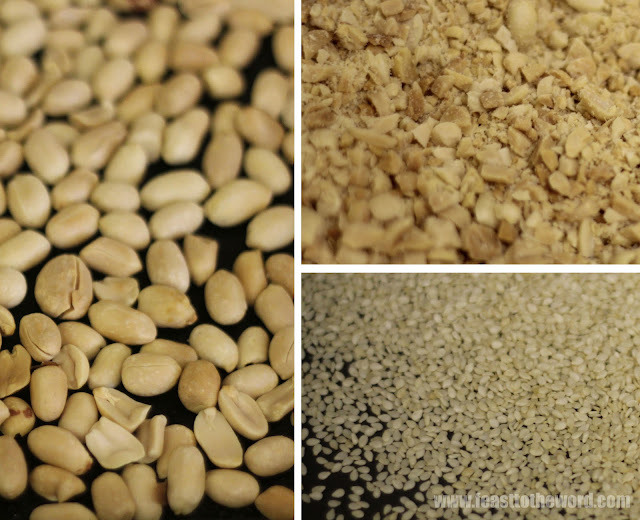 There are a few types of filling available but the most popular are the chopped peanuts, followed closely by the sweet red bean paste. But for me, the top choices will always be the nutty version. The sugared crunchy nuts filling provided a welcoming contrast to the thick, spongey pancakes. This thick doughy pancake snack were also commonly found in Malaysia too and sometime they're available in a thinner, crispier version. 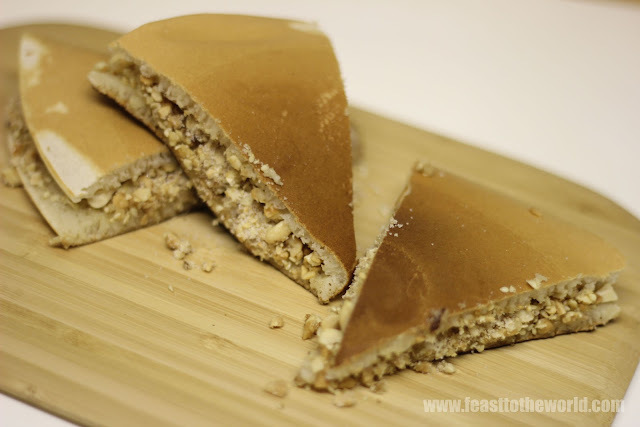 Back in Malaysia these deletable treats are known as Ban Jian Kuih or Apam Balik in Malay. Unlike to those that were found in Singapore, I normally had to hunt these down at the weekly Pasar Malam (night market). The night market consisted of little individual stalls set up to operate in the evening and all kinds of delicious street food will be serve made fresh before your very eyes. To make the aromatic fillings, the peanuts were first roasted to give a rich nutty aroma and the addition of the lightly toasted sesame seeds provided the subtle fragrance. One important note was that to use granulate sugar and not fine caster sugar as the large sugar crystals will add to the contrasting crunch which is what we are trying to achieve here. This is absolutely delicious and would make a great alternative to the normal pancake breakfast. All you need is some generous drizzle of perfumed maple syrup and perhaps even a dollop of indulgence cream and et voilà - Pancake breakfast for a champion. 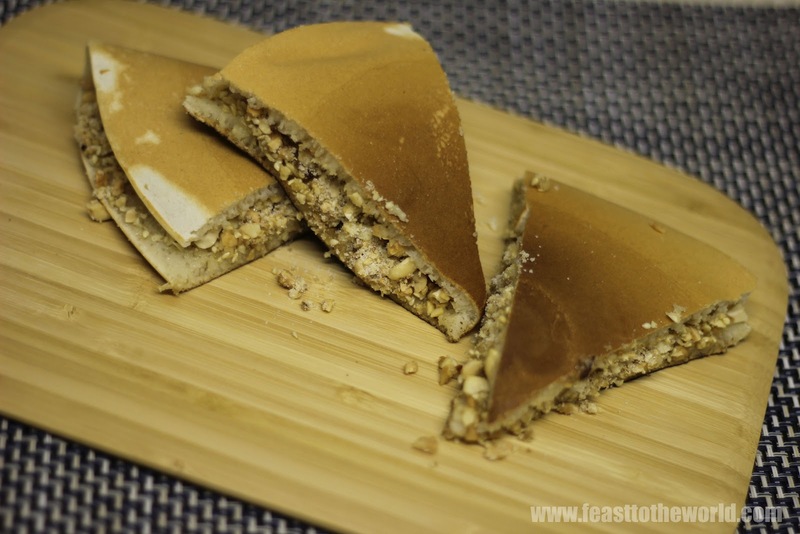 For a variation on this classic, try this Nyonya version of mine. Sieve the flour and baking powder into a large mixing bowl. Add the beaten eggs, caster sugar, water and mix thoroughly. Rest the mixture for about 20 minutes. Mix all the ingredients for the filling together in a separate bowl. After this time, heat up a large frying pan over medium heat. Lightly grease the pan with a little bit of sunflower oil. Ladle a scoop of the mixture and cook for 3-4 minutes, until tiny craters starts forming and the top looks dry with no wet patches. Add the filling to one side of the pancake and fold into half. Remove from the pan, slice into wedges and serves immediately. I am going to try this recipe out! Tried the Malaysian Pancake Co's in London? Is this the one that's outside Malaysian Kopi Tiam on Charing cross road? No I haven't.